So, you love hiking and other outdoor related activities, but hate doing it during the night because you can’t use both of your hands because of the flashlight? 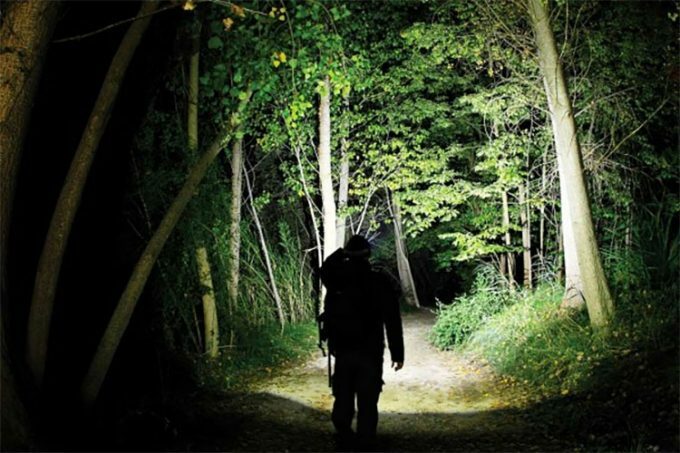 Would you love being able to hike during the night and have both of your hands free, but have the light as well? If your answer is yes, you should definitely check out some of the best LED headlights the market has to offer. The headlight will provide you the required light to see your path properly and monitor your surroundings easily. But, the older versions, with standard light bulbs, had the issue of light strength and battery life, but the LED headlights changed the game as they illuminate the area much better, and don’t drain the batteries that fast. However, we know that finding the perfect model can be complicated since there are so many on the market, and that’s why we decided to help you out. In this article, not only that you will have a chance to get more familiar with the most important features of LED headlight so that you know what to pay attention when buying one, but you will also read reviews of some of the best models on the market. Armed with the knowledge, we are sure that picking the perfect model for your needs will be a piece of cake. 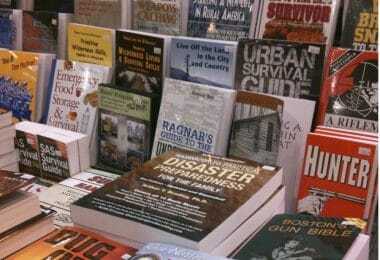 As with any other product, you first need to know what to pay attention before making the final decision. Here are the most important features that will help you narrow your search and make sure you buy exactly what you need. This refers to how far the light beam can reach. You definitely don’t want to put on a headlamp only to find out that you can’t see far with it. This puts you in a dangerous situation while out looking for a trail in the dark. Going for max beam distance will make the price bigger, so, you may not want to opt for top beam distance. However, know that the cheapest models don’t come with an envious beam distance. So, unless you specifically need a headlight that can light up an “entire mile” and your budget allows it, opt for a model that is somewhere in the middle. Light output is measured in lumens, whether it’s a projector, flashlight, or headlight. The amount of light being projected over an area, however, is no indication of the quality and distance of a beam. Long story short, knowing lumens output is good, but beam distance should hold the greater value in your assessment. And, you should also focus on the lens of the headlamp, as it needs to be able to give you the most of those Lumens. How long will your LED headlight last? The fact of the matter is that your lamp might undergo some extended use. And, given the circumstances, you will be using them in, you will not want that light flickering out while you’re out in the dark. The safest thing to do is to have a spare couple of batteries on hand. However, if that is not possible, or if you are out for an extended period, you will have to rely on the efficiency and battery life of your headlamp. So, choose wisely and pay attention to manufacturer specs, especially the power consumption. Can the headlight take a beating? The conditions in which you will be using a headlight will demand reliability. There are chances of dropping the headlamp while running, will it be able to withstand such falls,or a bad weather? Having it break through the course of an emergency pretty much negates its purpose. You definitely want a sturdy and reliable LED Headlight. Nothing less will do. Before choosing a certain headlamp model, you need to ask yourself just what outdoor activities you plan to use it for? The answer will affect what will be ideal for you to purchase. Runners who begin their routes early in the morning or end up running late into the darkness will require a headlamp with a strong battery. Bringing along extra batteries and having to switch them mid-run would be counterintuitive. Comfort and ergonomics are also factors that must be considered. Some headlamps aren’t built for the bump and grind attributed to running and will be quite uncomfortable. There are also headlamps with tail lights which will help potential oncoming traffic to identify you if you’re running along a road. If you want a spare light you can use at home for illumination during nighttime work, then you’re probably not going to need anything too expensive. A high lumen rating and beam distance aren’t going to be of much use (unless you live in a vast estate). Battery switching and recharging aren’t going to be much of an issue either. So for home use, you can pick options that are lower on the price scale. Some folks go backpacking for long periods over remote areas. This makes any access weight a hassle to handle. That being said, the weight of your headlamp will be critical and you need to find the lightest models. Getting the best products in the market is always a challenge given the amount of promotion being done on poor quality products. The list of headlamps given below has been selected among many based on the above-mentioned features and other related factors. Description: The most evident benefit of the Energizer 3 LED Headlamp is its price. It is by far one of the cheapest models in the market. That being said, it does provide a decent light output, good enough for lightning your way. The proximity beam does a pretty good job of providing a strong, even light. The battery life is rated at roughly 10 hours. That’s a lot of illumination time, giving you a lot of bang for your buck when you purchase batteries. You can reposition the orientation of the light to suit your needs as well. 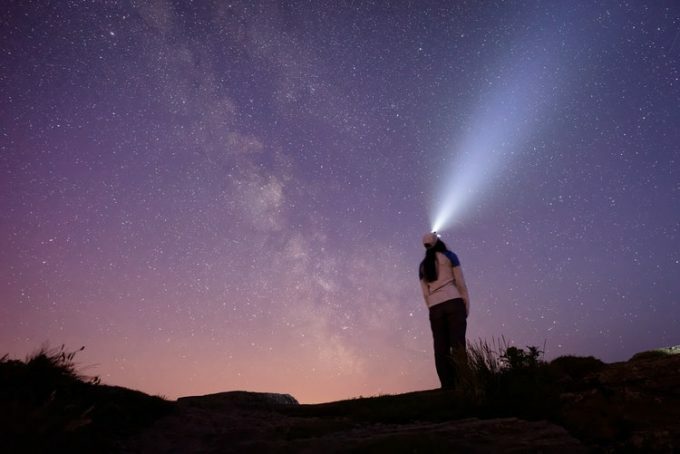 If you’re the sort of person who uses a headlamp while reading at night, this is a great, cost-effective solution as you won’t need the monstrous beams of light that more powerful headlamps offer. Take note that, however, this isn’t a top of the line headlight. The close proximity light has a pretty small width. If a wide close proximity light is what you need, then the Energizer 3 might not be the best option for you. It also falters in terms of brightness when set alongside higher priced alternatives. Overall, the Energizer 3 is a great headlamp to have around the house or glove compartment for occasional to moderate use. It’s also easy on the budget, so if you a high price is the only thing stopping you from buying a headlamp, this might be just right for you. Related: If one of the main reasons for buying a headlamp is for outdoor recreational activities, then there is a high probability that you need an overhead cover. You might have the tents, but some of the items that constantly get lost are the tent pegs. To avoid setting a loosely tied tent due to lack of pegs, you can consider buying the SE 9NRC10 Set Tent Pegs to replace the lost ones or for backup. 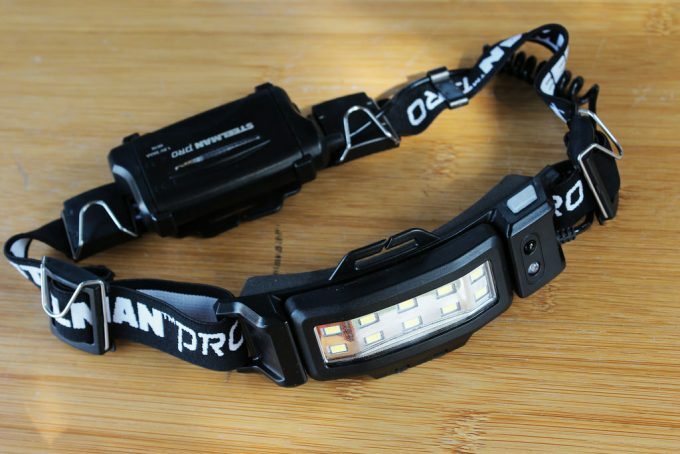 Description: The Black Diamond Gizmo Headlamp is a pretty good budget option amongst the headlamps on the market today. It boasts a compact construction, making it a viable companion for the occasional outdoor trip or easy storage for home use. One of the Black Diamond’s biggest advantages is its wide close proximity beam. This allows for very wide coverage, perfect for when you’re using both hands to fix something while in the dark or trying to find something that you’ve dropped. In terms of more heavy-duty outdoor use, however, the Black Diamond falls short to competition. The brightness its full strength provides, may not be enough to sufficiently illuminate running paths or roads in the night’s darkness. The light it provides will give most people with difficulty in identifying potential tripping hazards with peripheral vision and will require a bit of focus. The flashlight also has a decent battery life and a nifty feature that shuts off the light every two hours to prevent accidentally draining the battery. While that may be good for a household headlamp, using it when you’re out can lead to an accident if it coincides with a bad time. On the whole, the Black Diamond is a good headlamp for domestic use, its effective use outdoors will be quite limited, though. Related: Night vision devices require the slightest amount of light to magnify and make it a clear field. These gadgets are good for hunting, and thus the size of the beam should not be a limiting factor. 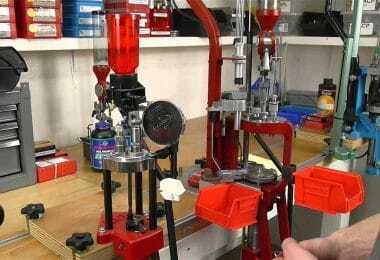 Get a CVLIFE AOE Hunting Rifle Scope for about $40 and see the difference. 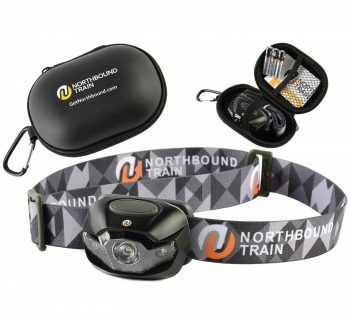 Description: Northbound Train Bright LED Headlamp brings to the table another casual camping or everyday use headlamp. It boasts a simple design for easy use. This, coupled with low-price makes it a viable option for casual users and great for domestic use. For the amount of brightness, it can maintain a full-strength beam for a good 4.2 hours. As a mid-price option, this Northbound Train model faces a lot of stiff competition from lower-priced units. In terms of beam distance, it provides a decent 27 m.
The lamp fits well in the head courtesy of the elastic, adjustable, and secure headband. This makes it ideal for a series of activities, among them reading. You can control the amount of brightness by a single push of a button. The battery has an estimated life of more than 150 hours when set to dim. In most of the times, you won’t require full light. The sturdy hinges ensure that the light points to where you want to illuminate. Related: If you are a regular camper or outdoor enthusiast, you know that sometimes the ground can be full of debris, sand, mud, water, insects, and many more things that make stretching on the ground almost impossible. A portable hammock will enable you to take a rest while suspended well above the ground, and it is also fun. The Northbound Train Portable Hammock is the perfect for the beach, camping, travel, or even backyard fun. Description: The Lighting Ever LED Headlamp is a great cost-effective headlamp for domestic and outdoor use. The 4 oz weight is not the lightest on our list, but it isn’t heavy enough to be unwieldy either. The adjustable modes offer some versatility depending on your needs. The red light allows minor illumination without diminishing night vision. The flashing mode helps in keeping drivers aware of your presence if you find yourself on the run by a road. The round head and top straps allow for use with a cap, helmet, or hard hat if the need is there. The beam is adjustable depending on the need for reorientation. The minor waterproofing is greatly beneficial for more rugged users and for use in the rain. In terms of brightness, however, the E Headlamp falters. Brightness isn’t enough to handle tight corners or distant path finding. That being said, for the low price it’s being sold at, the E Headlamp is still a very good purchase. Not suited for hunting, 78 lumens and the short beam might work against it. Related: You can easily lose your track in some of the outdoor activities like hiking or bush trekking. 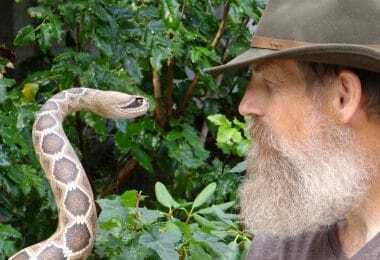 An A2S Paracord Survival Bracelet can help you in such situations. It has an emergency knife, whistle, compass, fire starter. 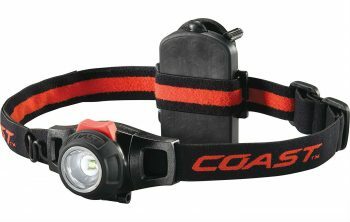 Description: The Coast HL7 Focusing LED Headlamp is a beast among headlamps. The 285 lumen LED bulbs can shoot a beam from a distance of over 400 feet. This makes it perfect for going through a night trail as the high level of brightness, will help most users identify potential hazards with their peripheral vision. The weight, while on the heavy side when set against lower-priced options, is much lighter than other heavy-duty headlamps. The close proximity beam also provides an incredibly bright and wide coverage, making it perfect for finding dropped items and working even in pitch black darkness. Where the HL7 falters is its battery life. The trade-off for the staggering brightness is the low battery life. Though this can be remedied by having a number of spare AAA handy. In terms of battery positioning, the HL7 is unique as it is at the rear, separate from the main bulk of the headlamp. The weight actually helps balance it out, but this may prove to be awkward for some users. The lack of a vertical strap also lessens the effective use with other pieces of headgear such as hard hats. Overall, this is one of the best headlamps on the market today. The balance of price, beam quality, and ergonomics make it a great pick. Related: With coast HL7 all your outdoor lighting needs are sorted. No need to buy a lantern lamp. The money saved can be used to buy a Dland Water Resistant Wireless Speaker. It’s efficient, and it will keep you entertained with no need for wire connections. 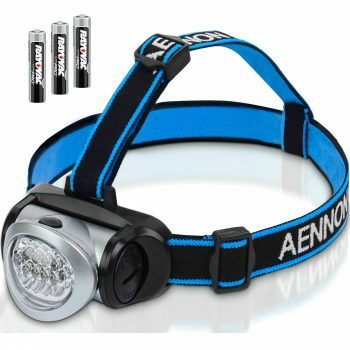 Description: The Aennon LED Headlamp is a solid performer for being a mid-priced headlamp. The lamp offers 4-brightness levels for easy adjustment depending on the job at hand. The adjustable angle also helps in providing ease and comfort to the variety of night jobs that will entail the use of a headlamp. The lamp is also able to project a red light for work that requires you to maintain night vision. The straps are easy to use, providing for comfortable use in darkened areas. The straps also allow for use with other headgear as well, such as a helmet, hard hat or cap. Also, a great feature that Aennon provides is a money back guarantee. If you aren’t satisfied, you can send it back to them for a refund or a new unit. The ease and comfort the Aennon headlamp allows make it great for a variety of indoor and outdoor activities. However, it only packs a 30 lumen brightness. With the low lumen rating, you can be pretty sure that the light isn’t top notch in terms of brightness. 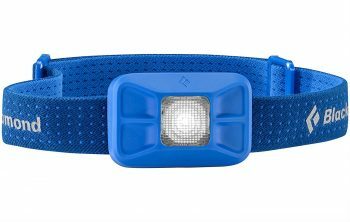 The lowest brightness makes this headlamp a bit risky to take in the pitch black darkness of more rugged nature trips. Pathfinding with the light will be potentially risky, especially in locations with dense vegetation and difficult terrain. 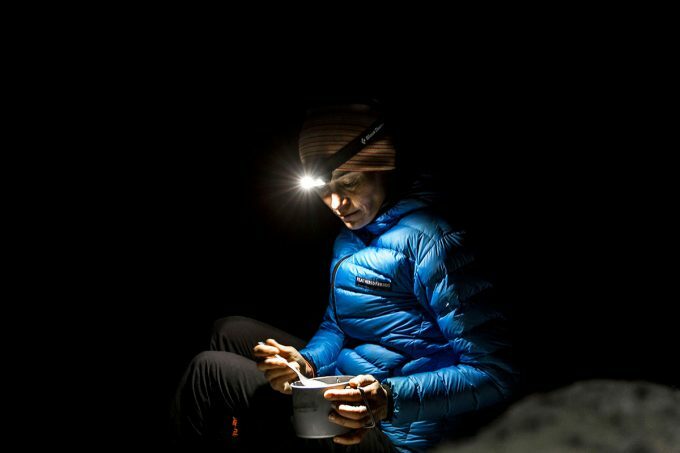 Related: Due to the low lumen of the Aennon Headlamp, you might require another lighting source to illuminate your camp or tent and only use the headlamp when going out or looking for something. The AYL Starlight Bright LED Lantern is the best option to provide a 360 degree lighting. 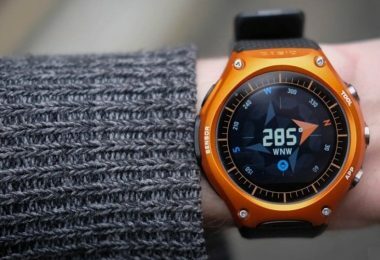 Its light output is 600, and it is shockproof as well as water resistant. 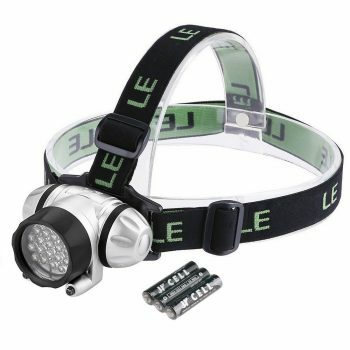 Description: The Shining Buddy LED Headlamp is a great all-around headlamp for a variety of uses. Aside from the standard high and low beams used for moving around outside and working with your hands respectively in the dark, it also comes a red beam great for night work that requires the preservation of night vision and a flashing light which makes it great for capturing the attention of passing drivers. The lightweight construction and adjustable straps give it good ergonomics and allow for little bobbing and jiggling when moving around. The lamp is also backed by a 90-day money back guarantee to allow you to see whether or not Shining buddy’s offering actually reaches your standard. In terms of price, the Shining Buddy headlamp isn’t the cheapest on the list, but It sure isn’t too expensive. Setting it alongside the top-tier headlamps will give you a great impression of just how great the value of this item is. Though it will not match the performance of those beasts, but the performance it provides is definitely well worth its cost. Related: Some situations just demand more brightness, the Foxelli 165 Lumen Headlamp is better suited for that. 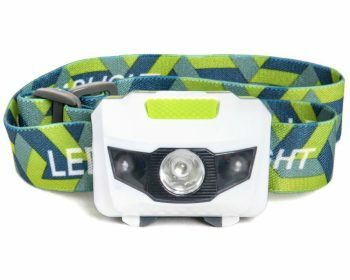 It is lightweight, waterproof, almost 45 hours runtime, super bright, and it uses triple A batteries. 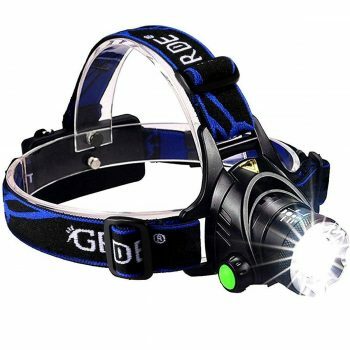 Description: The GRDE Zoomable LED Headlamp is a mid-tier LED headlamp option. Being mid-tier, however, doesn’t make it a bad choice. 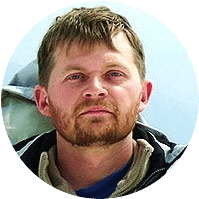 It packs a pair of rechargeable Li-ion batteries that will definitely save you on battery costs in the long run if you are a regular headlamp user. Its weight puts it among the heavier headlamp options, but by no means is it difficult to use. It offers a degree of water protection, making it viable for use in the rain. The single button control stops you from having to fiddle around with controls while you’re doing something in the dark. A feature that will definitely come in handy in the face of a high-stress situation. Despite all of these, it does have a couple of downsides. For one thing, over extended periods of use (and lapses in charging) users may find themselves running out of battery power. With that being said, the batteries aren’t as easy to acquire as the standard AAA batteries making use a bit tough. The water protection is good, however, like most mid-priced headlamps, accidentally submerge it and chances are you will break the lamp. Multifunction capability, 3 in 1, you can use on waist, head or on the desk. We have reached the end of our article. After reading everything, you are much better prepared and know what to keep an eye on when searching for the perfect LED headlamp for your needs. You can now choose the model based on your needs, such as the light beam distance, weight, power consumption, durability, or whatever you are looking from your headlamp. As far as the reviewed models go, rest assured that they are top notch in their class and that they really offer the features we named. But, not all of them are ideal for every purpose. 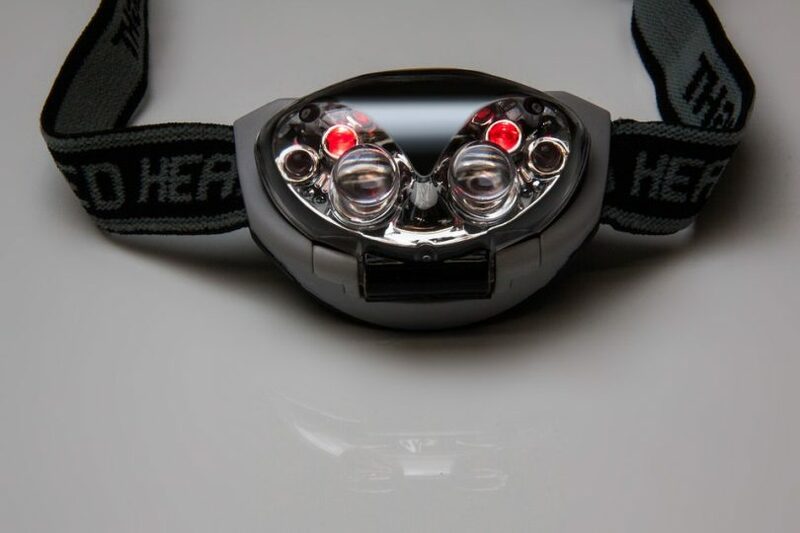 So, for example, for those of you who plan to use the headlamp just for reading in the tent, or replacing a short fuse when the lights in the house are down, you can consider getting the Black Diamond Gizmo Headlamp, as it offers a great, wide close proximity beam. On the other hand, if you need the headlamp for running in the night, you need to choose a model that offers bright light at longer distances and illuminates the entire path in front of you. This is where the Coast HL7 Headlamp would come in handy. Now, it’s your time to share some thoughts. Have you used any of the reviewed models before? What are your experiences with that specific model? Let us know by leaving a comment in the comments section below.